The blurb: This great PinyPon 6 Figure set is perfect for hours of creative fun. Comes complete with 4 Pinypon dolls, 2 pets and 30 accessories. 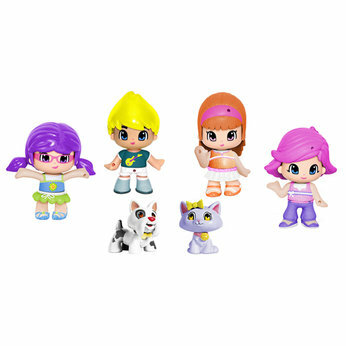 Pinypon dolls can be customised with the latest accessories and hair styles giving them a completely different, unique look. 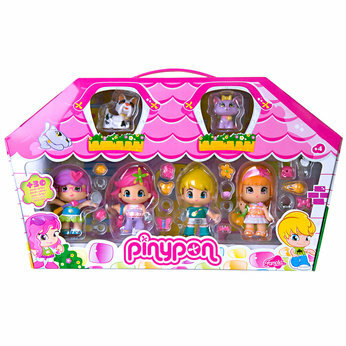 To go with the Pinypon caravan that I reviewed last week, we also received a bonus pack of six Pinypon figures. They come with all kinds of accessories and are all mix and match. They are quite sturdy figures that are all interchangeable. You can change the hair, faces, clothes and make them male or female. I really like the whole Pinypon set as it encourages imanginative play and although these are relatively pricey at £14.99 think that the kids will definitely get the use out of them. These would be better as an addition to one of the other sets i.e. the caravan or the car but they can be used as a stand alone toy too. Available online or instore from Toys R Us. The blurb: Take your Pinypon doll and her pet on a caravan adventure. This pretty flower caravan comes complete with a surfboard, a boat with a slide, deck chairs for relaxing in and even a little pool with a shower that really squirts out water. When I first saw this in the box I thought about giving it to my old friends at the hospital as I presumed that Chick was too old for it. Turns out I was completely wrong!! She caught a glimpse of it when I was trying to do something else and had it away and open quicker than I could say ‘no’!!! Out of everything that we’ve had so far this has definitely had the most use. I’m not sure if they have a clever advertising campaign (as Chick knows all the words) but according to her, the buzz on the playground is that these are the toys to ask for at Christmas. The set is mainly plastic and seems well made. It comes with a few annoying little pieces but actually is pretty cool. Everything folds up and can be put away inside the caravan so it stores very easily. Chick loves that it’s compact but also everything else about it. The fact that you can add water and make the shower actually work, the fact that the dolls come with different hair, faces, clothes and accessories. Every time she’s had a friend round they’ve had the set out and been role playing. As I say I thought that she’d be too old for it but I can’t recommend it highly enough from her point of view. The set is aimed at ages 4+ which I think is fine and as I say Chick is almost 9 and has used it constantly. 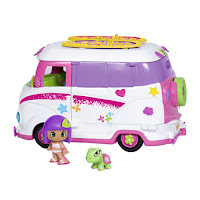 Smaller children could use the caravan and dolls but you would have to take out the tiny pieces. Retails at £24.99 and is available from Toys R Us online or instore. 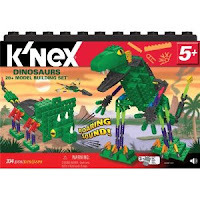 The blurb: The K'Nex Dinosaurs 20 Model Building Set is packed with 326 parts to build a T-Rex, Brontosaurus, Pterodactyl and more. Then bring them to life with the motion-activated sound brick! 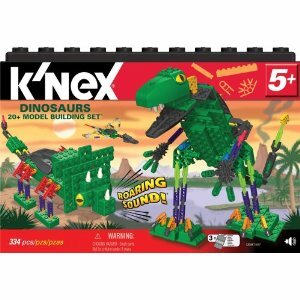 Instructions and building ideas are included for over 20 different dinosaur models, ranging from beginner to more challenging. Or, use your imagination and create your own dinosaur. 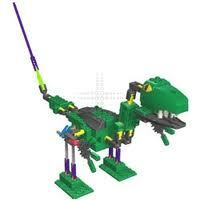 - Instructions aren’t the best and aren’t included for all the dinosaurs – although are downloadable. It’s aimed at ages 5+ which we both thought was fine. 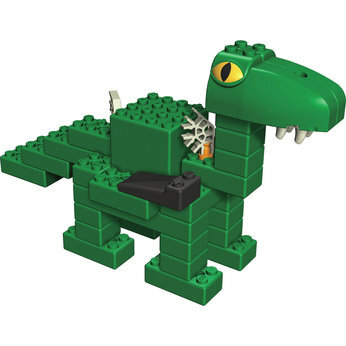 Older children can obviously complete the dinosaurs on their own and need much less parental help. The set retails for £19.99 which is really reasonable for a set of this kind. Available instore or online from Toys R Us. The blurb: The B.I.G Power Hand is a cool new way for boys to roleplay. This over-sized hand moves just like a real hand, allowing them to pick things up, scratch their backs, and just about anything else they can do with their real hands. The B.I.G Power Hand open up a lot of imaginative play possibilities. The B.I.G Power Hand features a form-fitting glove with an adjustable strap, spring-loaded joints for life-like articulation, an opposable thumb and rubberized grips on the fingers for enhanced gripping power. I don’t know if it’s because I’m a girl but I truly don’t understand the appeal of this!! For review purposes I roped in not only Chick but her Uncles Nick (27) and Ben (19) and cousin Sebastien (21) so that we could get a few different points of view. Much to their disappointment none of the grown up boys could get their hand into the extremely small glove (even more frustrating for Nick after it had taken him 10 minutes to try and get it out of the box!!) although it fitted Chick (8) perfectly. It’s made mainly of plastic and moves via the use of strings attached to the glove and the joints of the fingers (as you can see in the picture above). It’s not at all difficult to use and after a few practise finger wiggles Chick could pick things up and move them around. She played with it on and off for a couple of days but since then it’s just been left on the floor. You can buy extra accessories for the hand to customise it but I would see first how much they used it. Available to buy instore from Toys R Us. Don't forget to check out all the other amazing reviews on the Toybox.